The 260-6011 and 260-6021 Tipping Bucket Rain Gauges are standard precision instruments for measuring rainfall volume and/or rate. The 260-6011 and 260-6021 series gauges have an orifice diameter of 8" and a resolution of either 0.01" or 0.1 mm. The 260-6021 series gauges are electrically heated for use in areas where precipitation occurs in a frozen form. The 260-6011 and 260-6021 Tipping Bucket Rain Gauges are standard precision instruments for measuring rainfall volume and/or rate. Rain enters the gauge through a large funnel, the rim of which is protected by a metal ring to prevent distortion. Collected water passes through a debris-filtering screen and is funneled into one of two tipping buckets inside the gauge. 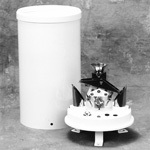 The bucket tips when a given amount of water has been collected; the amount is determined by gauge calibration. As the bucket tips, it causes a 0.1 second switch closure. The tip also brings a second bucket into position under the funnel, ready to fill and repeat the cycle. After the rain water is measured, it drains out through tubes in the base of the gauge; the drain holes are covered by screens to prevent insect entry. The 260-6011 and 260-6021 Series gauges have an orifice diameter of 8" and a resolution of either 0.01" or 0.1 mm. All gauges utilize a mercury-wetted reed switch. The mercury wetting prevents arcing and provides a better electrical contact. 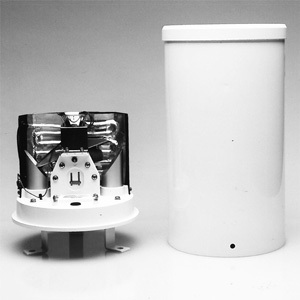 For areas where precipitation occurs in a frozen form, electrically heated rain and snow gauges are available. Each gauge includes four separate heaters. A NiChrome wire heater wraps around the collection funnel to melt the precipitation for measurement. A second NiChrome wire heater warms the internal components and the gauge base to prevent refreezing of the water inside the gauge. In addition, a cartridge heater is plugged into each of the gauge drain tubes so that the measured precipitation passes out of the gauge freely without freezing on contact with the cold outside air. The funnel and the base heaters are controlled by thermostats; the drain tube heaters are continuous duty.